Microsoft Certified System Engineers have proven through industry-recognized exams that cover a wide range of Microsoft products. This is an essential certification that shows true knowledge of Microsoft based operating systems. 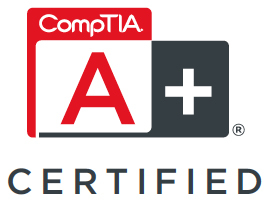 The CompTIA A+ certification validates understanding of the most common hardware and software technologies in business and certifies the skills necessary to support complex IT infrastructures. CompTIA A+ is a powerful credential that is globally recognized. Our partnership with DriveSavers ensures that if you have lost truly important data, you know that the right people will be working on it. DriveSavers has the highest success rate in the country for data recovery, as well as impeccable security standards. A business that has been accredited by the BBB has proven to be determined that the business meets accreditation standards, which includes a commitment to make a good faith effort to resolve any consumer complaints.